This card depicts Raiza the Storm Monarch transforming into Raiza the Mega Monarch. It has the same effect of Soul Exchange But skip your Battle Phase. Synchro Material is the Synchro Summon version of Soul Exchange. 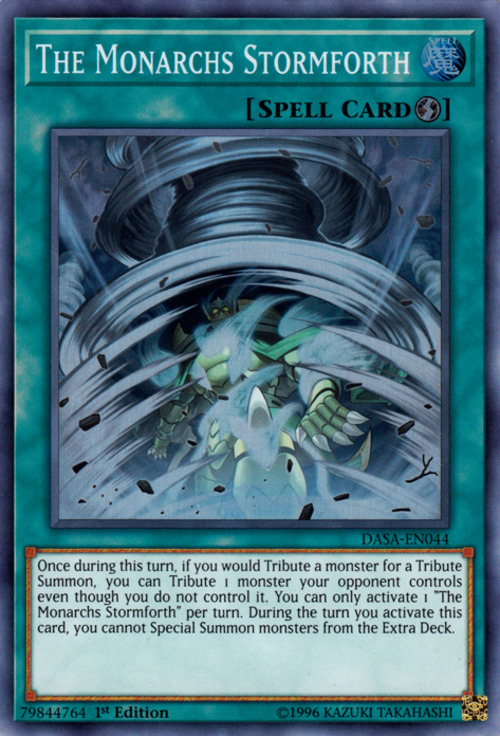 After this card resolves, if you would Tribute Summon a Level 7 or higher monster, you can Tribute 1 monster your opponent controls and 1 monster you control. A monster that has been affected by the effect of "Forbidden Lance" cannot be Tributed for a Tribute Summon using the effect of "The Monarchs Stormforth". Furthermore, if your opponent controls a monster that has been affected by the effect of "Forbidden Lance" and another monster, if you would Tribute Summon a monster using the effect of "The Monarchs Stormforth", you must choose that other monster. : Can a monster that has been affected by the effect of "Forbidden Lance" be Tributed for a Tribute Summon using the effect of "The Monarchs Stormforth"? This card can be activated even if your opponent does not control any monsters. This effect is not only applied to monsters your opponent controls when the effect resolves. During the turn this card is activated, if your opponent Special Summons a monster, that monster can be Tributed for a Tribute Summon. : Can you activate "The Monarchs Stormforth" if your opponent does not control any monsters? When this card resolves, a Tribute Summon is not performed. Once during the turn this card was activated, if you would Tribute Summon a monster, you can Tribute 1 monster your opponent controls. 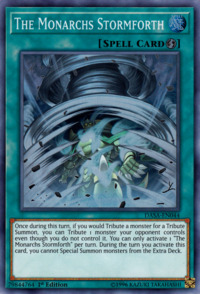 Therefore, even if a monster your opponent controls is Tributed for a Tribute Summon, that monster is not treated as being sent to the Graveyard by a card effect. : If an opponent's monster is Tributed for a Tribute Summon using "The Monarchs Stormforth", is that monster sent to the Graveyard by a card effect?